Since we have painted the bathroom in the Warm Summer hue, I have been trying to decide how to decorate it… I did not want to get the old accessories and towels back out because I am tired of them and most of them do not match anymore. I have been looking around online for some ideas because I haven’t had time to browse in person at Hobby Lobby or Home Goods. 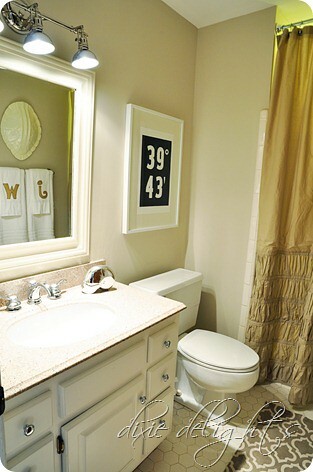 On one of the blogs I follow, Dixie Delights, I saw that she had just redone her bathroom. Right now we have spot lights and a huge sheet mirror above the sink. I want softer light like she has in this photo with the sconce and I would love to find a white framed mirror. 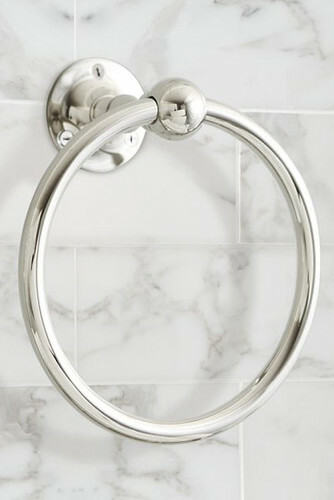 Right now, above the toilet we have a hand towel bar… I would love to remove this and put a towell ring next to our sink on the right side of the mirror. I think this is a lot more practical than a towel bar above a toilet! 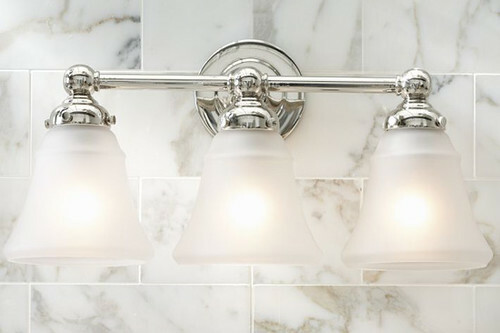 Since our Master Bedroom has grays/whites/yellows in it, I am continuing that trend in the bathroom. 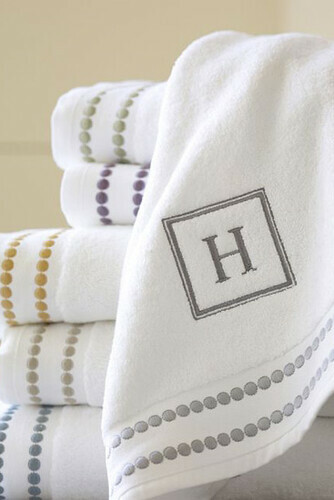 I would love a simple gray monogrammed towel on the towel ring like the one pictured above. 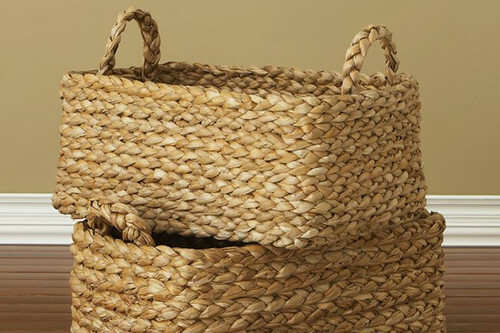 Now, without that towel bar above the toilet, I need to put something else there… I am not sure if this basket is it, I don’t think it is… but, I would love to put a basket on top of the toilet and fill it with some fun towels. Since our bedspread has yellow/white stripes with gray/white striped sheets, I was thinking some rolled up gray striped towels with some white ones would be fun and maybe a little faux plant inside the basket on the other side of the towels. 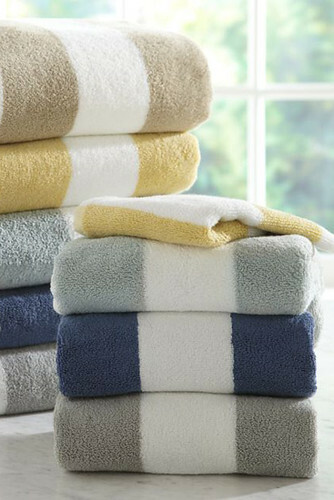 I really would love some striped towels like these to put in the basket. 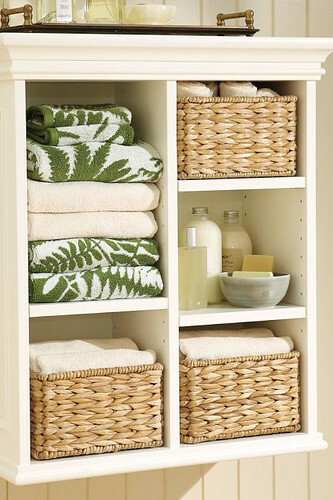 Now, a splurge… while browsing the web I fell in LOVE with this PBK White Cabinet with baskets. 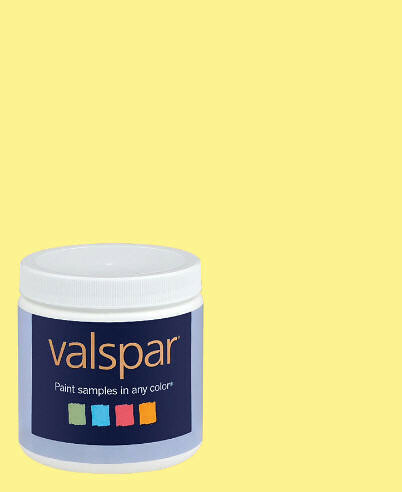 I love how open it is and I know it will look great against the contrast of the creamy yellow walls. I would have Brian hang this above the toilet/basket on the toilet. There is a nice little cubby space right there and it would fit perfectly. Then, there is a wall to the right of the shower.. I want to create a monogrammed canvas like she did on Dixie Delights except I would make the wooden monogram a light gray and I would leave the canvas painted white. I love monograms! 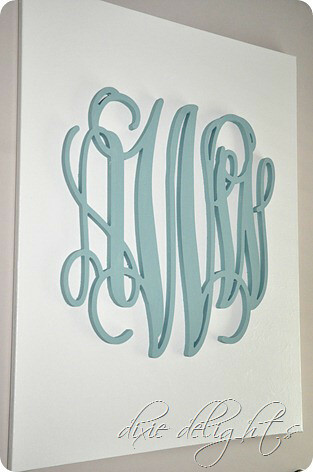 You can buy the wooden monograms off of Etsy for fairly cheap, even the large ones… then you just paint the monogram, paint the canvas white, glue and hang! So easy! 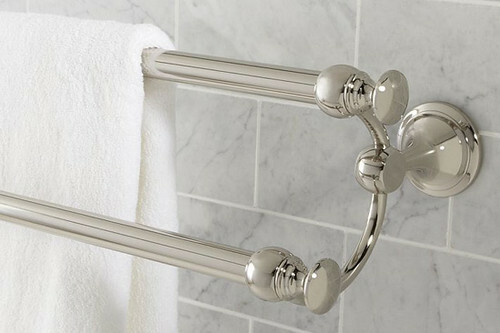 That is about all I have planned for the bathroom for now… I did see this double towel bar that I loved, but I will probably pass on it for now. What a neat idea, though!